Laser Photonics has developed a completely new industrial method known to the world as Zero Width Laser Cutting TechnologyTM (ZWLCTTM). 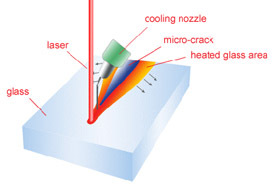 The ZWLCTTM technique uses a laser controlled Power Density profile on the material surface to generate the subsurface forces greater than intermolecular connections. Our patented Zero Width Laser Cutting TechnologyTM (ZWLCTTM) has the highest level of precision known to man. This technology has dramatically improved the substrate separation process, specifically for latest generations (Gen 6, 7, and 8) glass panels for Flat Panel Display (FPD) manufacturing.